KOJA Poetry Magazine is a biannual magazine dedicated to the exploration of Russian/American Avant-Gardes' crossroads. Poems by William James Austin, Bill Keith, Ric Leach, Andrew Lye, Nathan Levine, Yaroslav Mogutin and our Russian-American crew; also, the first English translation of Vladimir Sorokin's play "Dostoyevsky-trip". This issue also premieres KOJA's literary criticism section with William James Austin's & Igor Satanovsky's discussion on Charles Bernstein & the American Avant-Garde tradition. 8.5 x 11, 60 pages, hand-printed 3-color silkscreen jacket, stapled. Kogan, Richard Kostelanetz, Konstantin K. Kuzminsky, Mikhail Magazinnik, Inna Mattei Ososkova & Igor Satanovsky. 8.5 x 11, 60 pages, color cover, stapled. 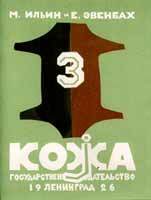 The premier issue of KOJA magazine (1996) presents its winning combination of out-there poetics, cutting-edge VisPo, and larger-than-life short fiction from both sides of the Atlantic. Contributors: Michael Basinski, Raymond Federman, Alex Galper, Sasha Kogan, Richard Kostelanetz, Konstantin K. Kuzminsky, Mikhail Magazinnik, Eileen Miles, Genrikh Sapgir, Inna Mattei Ososkova, Dennis Saleh, Igor Satanovsky, Spencer Selby, and others. 5.5 x 8.5, 66 pages, color cover, stapled. See www.monkeyfish.com/koja for excerpts from the premier issue. "... I would not select a single piece from issue #1 for my upcoming literary magazine... I hope you are going to like my new submissions to issue #2." "... You are right to request prospective authors buy a sample copy of your magazine... Having read the issue I received from you, I demand that you immediately return my submissions... I find your magazine to be extremely disgusting..."
"KOJA is an uneven mix but wide-ranging and definitely up-and-coming." 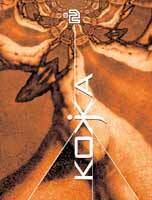 "KOJA so far is a very exciting color-xeroxed magazine..."
the widest interpretation of new and challenging writing now being written." "An excellent new magazine of innovative writing." We require that authors submitting manuscripts be familiar with previous issues of Koja magazine. Only experimental poetry will be accepted. Please query at kojapress@artmail.org.